The Hamptons style captured our hearts a long time ago - here's how to replicate the Hamptons look in your home. Pictured: 63 Amy Street, Hawthorne is the epitome of Hamptons living. Sold by Sarah Hackett of Place Bulimba. Pictured: 2 Colchester Court, Maudsland, sold by Garry Willis of Harcourts Coastal. Pictured: 46 Newman Avenue, Camp Hill for sale through Joanna Gianniotis and Andrew Bradley of Place, as seen on Luxury List. Sure, we're a long way from New York's playground for the fabulously wealthy, but that certainly hasn't dampened the spirits of renovators, builders and architects drawing inspiration from the highly sought after Hamptons style. At last count, at least three Hamptons inspired new builds have popped up on my street. But who can blame anyone for wanting to replicate the look? The Hamptons style is coastal luxe, masculine exterior features meets luxe, plush interiors. 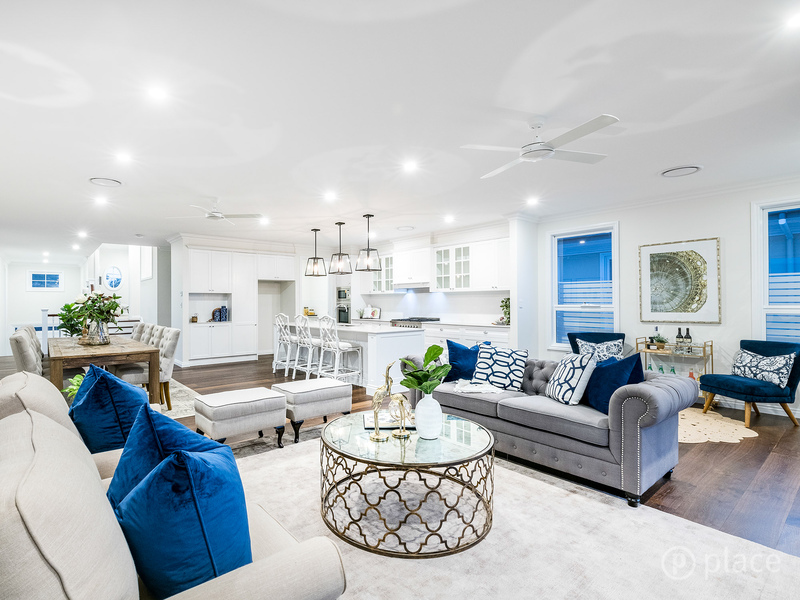 The Aussie interpretation of Hamptons style is a little bit more laidback than the New York version - combining elements of our trademark coastal aesthetic with the polished Hamptons vibe. Obsessed with the look? Here's how to recreate it. Pictured: 63 Amy Street, Hawthorne is the epitome of Hamptons living. 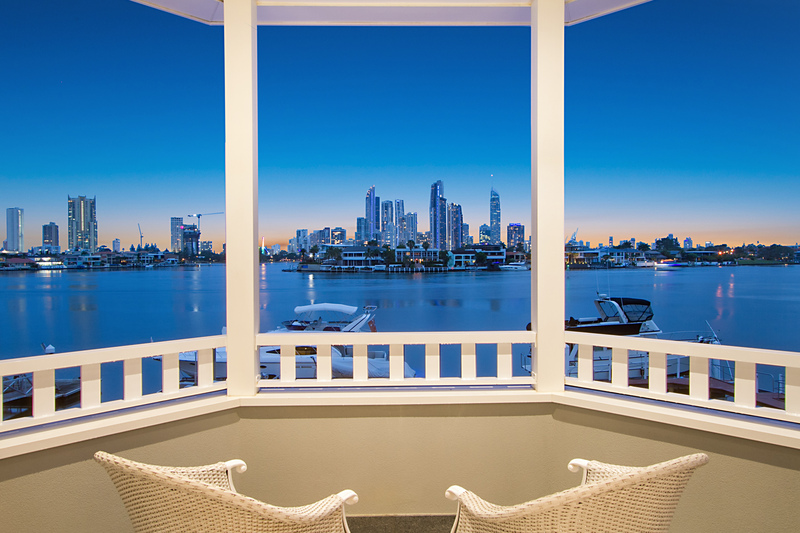 Sold by Sarah Hackett of Place Bulimba as seen on Luxury List. White, blue, and marble all over, this is basically the Chris Hemsworth of kitchens, and this dreamy Hamptons kitchen has ticked all the boxes. 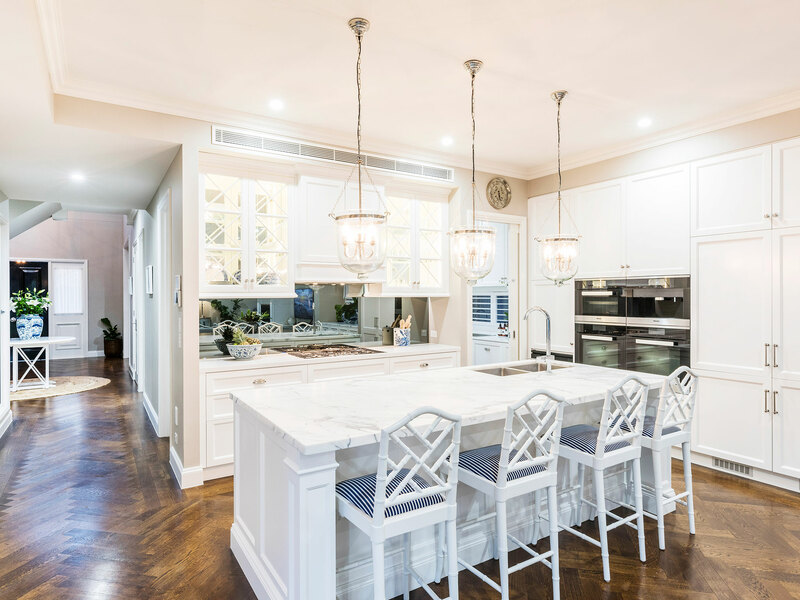 Bold marble benchtops, high ceilings with low hanging lights, bar seating, and tons of white washed cabinets are the key to creating a classic Hamptons inspired kitchen. The nautical upholstery on the chairs and oriental jars filled with flowers and fruit are the little touches that complete the look. No Hamptons style home would be complete without the iconic wooden stairway. 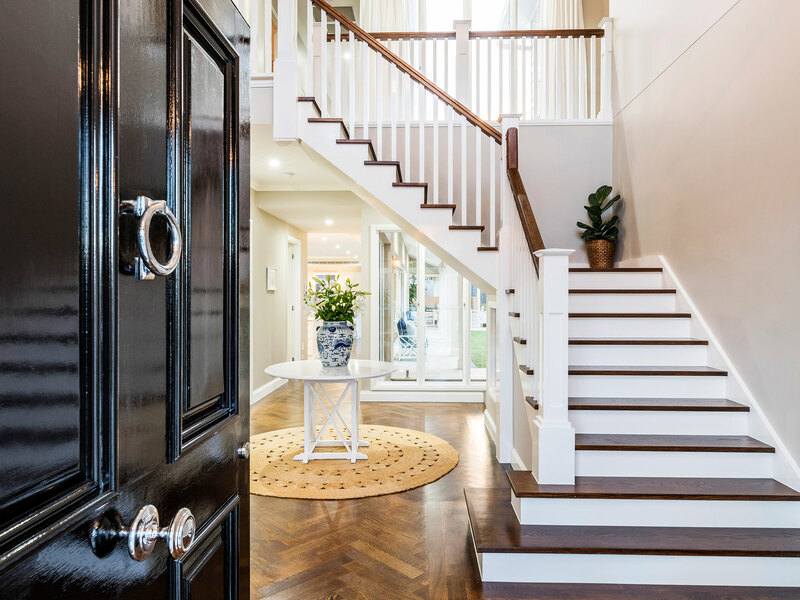 This gorgeous property in Hawthorne combines the classic aesthetic of a Queenslander with a dose of Hamptons chic for good measure. The end result? A truly showstopping abode. Pictured: 1A Yacht Street, Southport. Sold by Eddie Wardale and Michael Kollosche as seen on Luxury List. Alright, so strictly speaking you don't really need this view to recreate the Hamptons look... but hey, it hardly goes astray! Agent Eddie Wardale told WILLIAMS MEDIA the home was built to be functional yet homely. This amazing Camp Hill home showcases Hamptons style in all its glory. The key to Hamptons style lies in the colour palette - think glossy, deep wooden tones mixed with a pared-back palette of greys and you're bang on the money. Don't forget about accents of coastal tones either, like rich blues and classic white. Pictured: 1 Jane Place, Dural for sale through Darren Curtis and Carys Adams of Ken Jacobs Double Bay, as seen on Luxury List. As far as outdoor entertaining goes, this resort-style backyard is pretty freaking spectacular. Designed for entertaining, this Hamptons-inspired mansion is set amid landscaped grounds, complete with a host of recreational amenities, such as a 12x6m heated pool and championship tennis court, as well as facilities for equestrian enthusiasts, including state-of-the-art stables, tack room, and dressage arena. Framed by a stunning array of windows and French doors, this is a simply stunning Hamptons-themed home.